Showtime's new descent into the macabre looks to be a surefire hit for the network. Set in 1890's London, there is atmosphere aplenty as characters from some of literature's greatest hits including Dr. Frankenstein, his creature, and Dorian Gray are brought together with familiar types such as Sir Malcolm the wealthy African explorer, the mystic, Vanessa Ives, a Buffalo Bill style actor/sharpshooter, and, of course, vampires. The pace of the show has a slow, Gothic steadiness that feels perfect allowing the viewer to absorb and watch in awe, all the visual wonders its artists and special effects teams have created. Costumes, sets lighting design . . . all lend an authenticity to a time and place of an era both breathtaking and terrifying. If you aren't taken in by the time of the descent into an underworld of supernatural gore and horror in the first half of the pilot, this is definitely not your show. 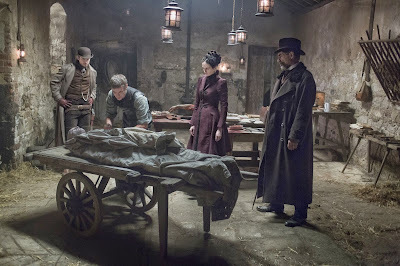 Penny Dreadful also happens to be deliciously all over the place; detective story, a horror story, supernatural mystery hybrid as well as a grand period costume drama, with a bit of Egyptology thrown in for good measure. What keeps it all from jumbling into a mess, and makes it unique, is how equal attention appears to have been paid to all of its complex elements combining into something that can make the senses reel. Lovers of graphic gore will find plenty to enjoy here, what with the show being packed with hacked up limbs, corpses galore, blood and some unsettling surprises waiting around every corner. The cast; Timothy Dalton, Eva Green, Josh Hartnett, Harry Treadaway, Rory Kinnear and Billie Piper are all at the top of their game creating well thought out and entirely believable, complex characters. We've been lucky to have some remarkable period pieces on television The Tudor's, Game of Thrones, and most recently The History Channel's sensational Vikings. Based on its first two episodes, Penny Dreadful can easily join that company.